There's nothing more tempting than the convenience—and greasy flavors—of a breakfast sandwich from a fast-food restaurant. Especially when stress is high, and the calendar is jampacked, these can be hard to resist! But in a matter of minutes you can make your own breakfast sandwich that tastes better and is better for you! Look no further than this hot and tasty egg and bacon sammy, with fresh avocado and cheese that isn't rubbery. Trust us: You'll be glad you opted out of the drive-thru line! Cook the eggs however desired (scrambled, fried, poached, etc.). Toast the whole-wheat bread until golden brown and place eggs on one slice of toast. 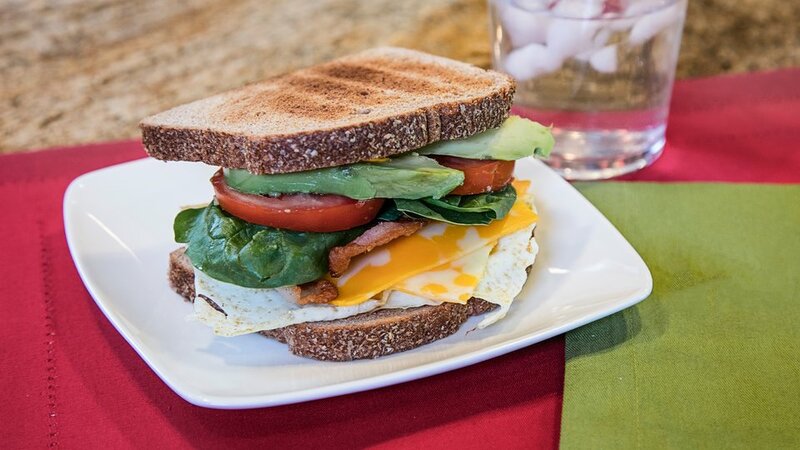 Lay both slices of cheese on top of the eggs, followed by the bacon, spinach, tomato, and avocado. Top the sandwich with the second piece of toast. Serve hot.